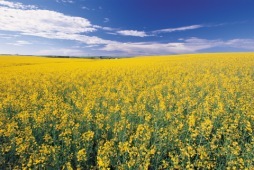 Alberta's Heartland is made up of huge open areas of farmland and forest, dotted with beautiful cities and towns. This is the area, where the first settlers came to and the skies are the biggest and bluest. Many special events and attractions are waiting for you to discover. Cities and towns such as Red Deer, Sangudo, Lacombe, Wainwright and Vegreville are certainly worth a stop, when you are travelling trough Alberta's Heartland. About 100 years ago, prayers to end a drought at Lac Sainte Anne were answered. Now it is believed, that the waters have God-given curative powers. An annual pilgrimage in July draws many thousand people from around the province and across North America to this lake. Father Lacombe established the first Roman Catholic Mission in the area, which was named after the lake Lac Ste. Anne that is close by. Many miracles took place at the water's edge. Bathing in the sparkling blue waters of Lac Ste. Anne may heal the sick and infirm. Lac Ste. Anne County offers the Original West, with farmlands, bush, many beautiful lakes and sandy beaches, rivers, and scenic country sides. This area is well known for its richness on wildlife. There are many things to discover, when you explore the rolling hills of this beautiful area. Away from tourist crowds, the Cowboy Life Style and the Pioneer History are here still alive. Country music, rodeos, farmer markets and first of all, a warm welcome awaits you everywhere. Alberta's Heartland is renown for its friendly people. Discover bison and elk ranches or go bow hunting on a wild boar ranch. The many lakes and beautiful sandy beaches invite you to relax or to enjoy all kind of water sports. Great sunsets and breathtaking northern lights are complimentary, when you enjoy your Alberta's Heartland adventure. Historic sides and many more. The Lac Ste. Anne area, in the Heartland of Alberta, is still a secret vacation tip for individuals, families, outdoor enthusiasts, and country fans alike. You will find high quality vacation with a variety of activities to do to enjoy and relax. 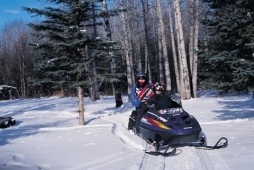 Visitors to the Lac Ste. Anne County are close to Alberta's main attractions. The province's capital city, Edmonton, is just a 1 hour dive to the west. It is the only known sundial to take it's shape from the historical country grain elevator which is fast becoming obsolete. The name on the elevator has traditionally identified small towns and villages since the days of the settlement. The Sangudo Sundial-Elevator is one of the biggest sundials in existence with a height of 21 feet and a total weight of over 40 tons, including the marker rocks. The design provides for a modern sculpted appearance of a country Grain Elevator with a shingled roof, permanency (100 year range) and simplicity and economy of construction utilising local volunteer craftsmen. The design is indeed unique and has been officially copyrighted by the Village of Sangudo. Red Deer is located midway between Edmonton to the North and Calgary to the South and is in the centre of grain and cattle country. This nice city is certainly worth some time, as it has some interesting points to visit. A friendly atmosphere, combined with fresh produce, baking, crafts and other items are available at the Red Deer Farmers Market. The market is open from 8:00 a.m. to 12:00 p.m. each Saturday from the May long weekend to Thanksgiving. Heritage Square displays the early beginnings of Red Deer in a park like setting including a replica of the 1887 Crossing School and the Stevenson Hall Block, that is as a matter of fact Red Deer's oldest building. Don't miss the Aspelund Laft Hus, a sod-roofed Norwegian farm house. The well-known Canadian architect Douglas Cardinal had been inspired by a spider's web, when he designed St. Mary's Church. Visitors are welcome to visit the church weekdays from 2:00 to 5:00 pm. This is a year-round information centre to learn more about Alberta. An equestrian centre and activities such as trail riding, hiking and biking along the park trails are waiting for you. The Old Court House nowadays serves as a community art centre with changing exhibits of Alberta artists. A coffee shop can accommodate your lunch needs. Step back in history into the lives of First Nations, settlers and the North West Mounted Police. This reconstructed fort shows the beginning of Red Deer and is open mid May to September. From prehistoric to present - this is the theme of the Red Deer and District Museum. Learn about the area's history and explore one of the ever-changing art galleries. The beach at Sylvan Lake Provincial Park attracts young and old in summertime. Wild Rapids offers 12 free-standing water-slides on the sunny shores of Sylvan Lake. Sunbathing, swimming, relaxing - you name it. Aspen Beach Provincial Park is the first Provincial Park declared in Alberta and offers a wide sandy beach, that is simply ideal for all activities such as swimming, sunbathing, and paddling. The vibrant community of Lacombe offers an abundance of opportunities for golfing, fishing, sightseeing, photography, bird watching and shopping. History and present time - this is the blend you can find in Lacombe. A walking tour of the historic architecture is offered by the local historic society. Explore The Michener House -the birthplace of one of Canada's greatest statesmen, Roland Michener. Built in 1902, this beautifully preserved historic structure stands as it did in pioneer times. It is one of only two Blacksmith Shops in Alberta still standing on their original site. The Blacksmith Shop Museum is unique, not only that in it stands on its original site, but also because it is so immaculately restored with original implements, tools and equipment. Phone 782-3933 or 782-7333 to book a tour, demonstration or for more information. Take a walk and learn about Lacombe! The Maski-Pitoon Historical Society offers seasonal walking tours of historic downtown Lacombe during the summer. To book a tour, call 782-3933. Wainwright offers a wide range of services including numerous restaurants, accommodations, retail establishments, business and personal services, medical services and recreational opportunities. 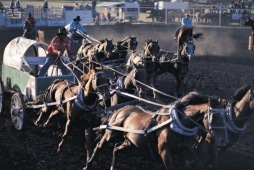 Stampede week in June involves numerous events including a parade, midway, 4 day professional rodeo and the world's largest professional chuckwagon race. Camp Wainwright's buffalo herd serves as a reminder that the land now in possession of the Department of National Defence was once the original Buffalo National Park which was created by the Canadian Government to preserve the endangered bison in 1908. 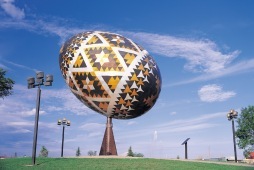 Vegreville is not only the centre of Alberta's Ukrainian culture, but also claims to have the world's largest Easter egg. This nine meter high egg, built of aluminium based on concrete and steel, is decorated in traditional Ukrainian style. It was built in 1975 to commemorate the centennial of the formation of the Royal Canadian Mounted Police in Alberta. The giant Easter egg, symbolising the peace and security the Mounties had offered the area's pioneers and their descendants, is recognised around the world as not only a unique artistic masterpiece but also an achievement of nine mathematical, architectural and engineering firsts. The design represents the first computer modelling of an egg. Vegreville's Main Street awaits you with historical murals and authentically restored early 1900's buildings, where you can explore the town's hundred-year history, engraved on bronze plaques set in the paving-stone-sidewalks. The Vegreville Regional Museum has many displays showing the settlement and development of the area. Within the Vegreville Regional Museum you will find the International Police Museum with a great collection of police items from around the world. Experience the chills and thrills of the races combined with western-style hospitality and entertainment. This event takes place in June. This Travel Guide was kindly made available with the help of Diana Krah of Lakeview Guest Ranch in Sangudo.